Yesterday was chock-full of events and discovery. It was John Albert's very first day at his very first paying job. He was very excited! He is working at AJ Wright, a store like Marshall's or TJ Maxx. In fact, they are all owned by the same company. He will be working in the back room doing, are you ready? Hanger Management. Yes, really. They even had a video for him to watch, which, when they said the name of it, sounded like Anger Management. It wasn't until I was on my way home that I realized what they really said and burst out laughing. By myself. In the truck. People stared. Not long after returning home it started to rain. And rain. And rain. Guess who does not like getting wet? He ran so fast he nearly knocked me over! I had read Alicia's post about her baking her first loaf of bread. It looked heavenly and made me want to make some of my own. So, I pulled out my trusty copy of the New York Times No-Knead Bread recipe and added a few tablespoons of sugar and some raisins. I made two loaves- one for us and one to share. It is delicious. Crusty top, soft insides. Toasted and spread with real butter, it is divine. Thanks for the inspiration, Alicia! I was not expecting such a soft dough. The dough we made last week was a bit more sturdy. This was very light and airy and very tender. But still, it made twenty muffins, and they rose as they should, like little round pillows on my baking sheet. Once risen, you cook them in a pan sprinkled with corn meal. No baking! Sweet. About 7-9 minutes on each side and, Voila! C'est finis! Complete with lovely "nooks and crannies" for buttery goodness. And you know that nothing was going to stop me from having one right away! Out came the butter and Bonne Maman Raspberry jam. Pop into the toaster went the fresh muffins and when crisped to perfection, they were spread generously with the aforementioned butter and jam and popped into my mouth. My tummy was quite happy to be full of English muffins. They were such a success that I think I will make them from now on. They are simple and good and very inexpensive to make. I just don't think I will make bread and muffins on the same night again. While preheating the oven for the bread, I realized that I had the dough for the English muffins in there rising. It could have been a disaster, but it wasn't. It was a wonderful end to a very nice day. Something else that is wonderful is Robin's blog, one still frame. I met Robin in Kentucky at Frannie's Girlfriends Gathering. We had a great time and Robin (Beulah) and her mom, Pat (Tilda), are the nicest women. You can tell they are best friends. It was a treat to be around them, hear their stories and get to know them. Robin's blog is full of beautiful contemplations and photographs that she takes herself. Quiet, lovely, calming, intensely profound words and images will take your breath away. I promise. 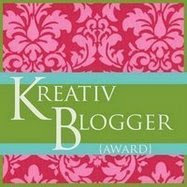 I don't know how Kreativ I am , but I am very grateful and honored. It made my day when I discovered what she had done. Not for any other reason than I knew she had thought of me. I think that is what I like best about blogging, the thinking of others. Someone pops into your mind and you can, with the click of a mouse, go visit, read what is happening in their world, leave a comment and they instantly know they have been thought of by someone. What a lovely thing that is. Those muffins brought back lovely memories of Sunday afternoon teatime. My sisters and I took turns with the toasting fork by the roaring fire, then lots of lovely butter and my mother's home made jam. That's another good thing about blogging - the stirring of memories. I've never even thought about making my own English muffins but after seeing and reading about yours, I got out my Fannie Farmer and tomorrow will go and get yeast. YUM! Of course I'm the only one who eats them so in the freezer they will go after they are cooked. They sure look good! Hello Karin! Oh my goodness! The English Muffins look heavely!! Now I am hungry! LOL! I am going to try this recipes! Thanks! Well, good on John Albert! Hanger management...what a hoot! Your bread and muffins look delicious...maybe I can give the recipes to Jack...he's the chef, cook, baker in our family! I 'bat cleanup'...haha. Oh Yummy! I was drooling as I looked at your photos! Happy Mother's day to you! i will have to try english muffins. I just checked that book out that alicia mentioned from the library. it is wonderful. the photographs are lovely. i think you would really enjoy it!